• Your best-friend colleague just got laid-off from the company. • You got a low grade in your performance appraisal (but you know you did your job very well). • Your boss promised you a promotion but months or years passed, it hasn’t come. • Your sales proposal or presentation was turn down by your potential client or customer. • Your filed leaves were rejected by your boss. • You moved into a new company and found out that it’s worse than your previous job. So on and so forth. 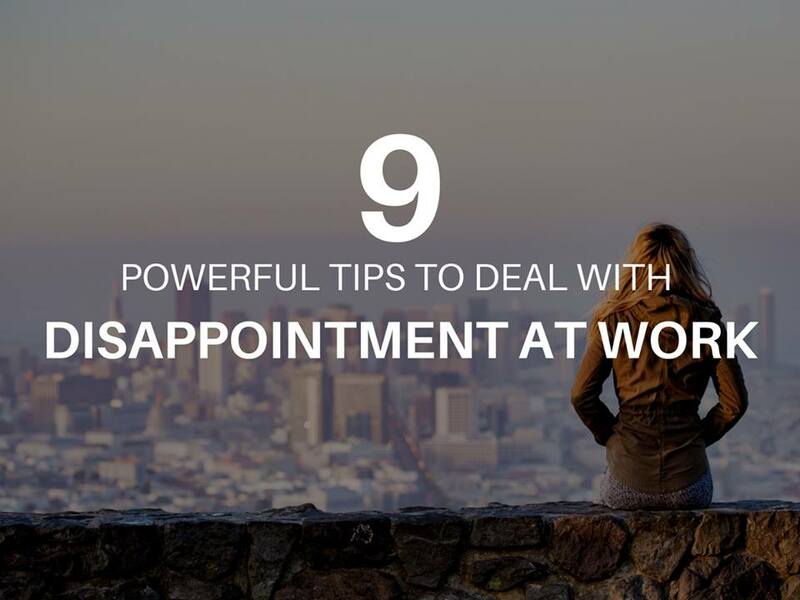 If any of the above is something you experienced or have come to know from other people,, here are nine simple tips to deal with your disappointment at work. Everyone experiences disappointments at work. There are other people who’ve been through the same situation but was able to overcome it because they’ve managed their emotions well. Don’t be too hard on yourself. Thinking “you’re just not good enough” shouldn’t be your statement. Don’t discourage yourself – you have other things you can do but others can’t. Believe in yourself. Don’t drown yourself in too much emotions. Opportunities will come. It just takes time. Your next big shot awaits you. 2. MANAGE YOUR EMOTIONS. SMILE. Be honest. Cry if you can’t control it. Talk to a friend, a mentor, or someone you trust the most and show that you’re not okay. It’s okay not be okay at times. But don’t let that disappointment demotivate you for the entire year. Emotions can eat you up. It can get to a point where you start you at your officemate (even if he’s not the cause of your disappointment), or hide in a corner for the whole afternoon or day (AWOL for several times). This maybe an exaggeration, but it can happen at times that you can’t control your emotions, especially if family situation is a factor in your disappointment. Manager your emotions. Don’t let that disappointment seriously harm your professional reputation and work performance. 3. DON’T MAKE RUSHED DECISIONS, STAY CALM. Before deciding to quit your job. Consider your full situation – your family and the impact of resigning from your job on your current state. Quitting isn’t the first option after you get disappointed. Don’t make decisions when your emotions is on the highest level. Quick and unwise decisions can often do more harm than good. Stay calm. Relax. Talk to your closest friend and ask for advice. The higher the expectations, the higher the chance you’ll get disappointed. Whether it is an expectation on yourself, from a boss , or even from outside of the company, you have to check if what caused your disappointment is something you really have to expect. Ask the question, is it something you should expect in the first place? Maybe there’s no promise from your boss for promotion or salary increase. Words from your boss are easier said but done. Talk to your boss if this is something they can work out in the next quarter or six months. Is your expectation unrealistic enough (more likely to fail)? Is your expectation flexible? Ponder these questions so you won’t be setting high expectations on anything and on anybody. 5. DON’T BE RESISTANT TO CHANGE. Transferring to a new role or to a new department or being given a task by your boss that is out of your comfort zone are changes that had to be made for company improvement. You may not see it at first hand because it’s too uncomfortable to adapt to the change, but over time you’ll see that these things happen for the betterment of your team or your department. Set your mindset right. Adapt to the new corporate setting or environment. Maybe, you are the only person who can’t accept the change, thus, affecting your work performance and productivity. Adapt to the new culture and new environment and work out with your relationships with your officemates and boss. If it’s a new company you just joined in, learn to adapt. Your current company isn’t the same as your previous one. 6. IDENTIFY THE DYSFUNCTIONAL AND IMPROVE ON IT. Assessment shouldn’t only be done by your boss, or by your manager/supervisor/HR during quarterly or annual reviews. You should also evaluate yourself. After you manage your emotions after a bad situation, learn to identify what’s dysfunctional on your side. Maybe your proposal has been rejected because it lacks certain important details that you have to emphasize during the presentation. Maybe your supporting documents or ideas aren’t strong enough to meet the company’s standards to get the promotion or salary increase. Maybe your lack or inability is actually your weakness that you should have delegated in the first place, so you could have succeeded in your project. Another example, if you file leaves weeks before the scheduled event (if it’s not an emergency), your boss should have accepted your request for leave. Identify the dysfunction and work on it. 7. ASK HELP FROM TRUSTED PEOPLE. What are true friends for if they can’t comfort you in times of disappointment? Don’t just ask for advice from people whom you don’t trust, especially if it is your officemate that you’re talking to. In rare cases, it could be used as a backfire against you in your office. If you have friends within your network, a mentor or your previous boss from other companies, they’re much better to ask with regards to corporate advice and tips. 8. CONSIDER POSSIBILITIES AND OPPORTUNITIES. Some disappointments can often lead to appointment, as they always say. Always consider possibilities that you can act on to turn that disappointment into an opportunity. For example, if you didn’t get the raise/promotion but one of your officemates did, maybe that’s an opportunity for your boss that you’re also a good candidate for promotion or salary increase (waiting for weeks after your colleague’s promotion is the best time to propose it to your boss). While you can’t open about what happened to your officemate, you can ask your direct boss on feedback about your job and how you could get higher up in your position – what are the needed skills, performance, quota, etc..
9. WAIT AND QUIT ONLY IF YOU DID ALL POSSIBILITIES THAT YOU CAN THINK. It’s normal to say, “I quit” after you’ve experienced disappointment. However, always consider things before you actually do so. Have you saved enough money to cover your monthly expenses? When you leave the job, you should have something to spend in between jobs. Have you talked to your boss about your compensation or any work matters? Being true to your boss will give the signal that you’re actually looking for better opportunities in your office. Otherwise, you’ll always find yourself complaining about your job or your boss. Note: your boss can also relate to your needs, he’s human too. Have you built authentic relationships with your officemates? You can’t say you’re not fit to the culture if you’re not doing anything with your work relationships. Maybe you’ve explored all the possibilities that you can think of, one thing you need do is to wait. If you’re working in a startup company, growth is unexpected. If you wait a little longer, you’ll get the promotion or salary increase that you’ll have missed if you just quit your job too early. Maybe your company has a good career advancement program. Benefits are good and the culture fits you, but you’re still getting disappointed. Perhaps there’s a gap between your passion and work engagement. Your job isn’t what aligned to what you really want to do in life. Maybe you’ve found a better opportunity elsewhere (i.e. better career growth or better culture) and have decided it wisely, your option maybe is to move to another company already. Just because you get disappointed doesn’t mean you have to leave your job. There are other possibilities that you haven’t done yet but can help you solve the problem. Your last option is to quit the job. Of course, there are serious reasons to quit the job too early on, but if after you just disappointed, you immediately quit, you are likely to lose than win.